This is the pattern for Zelda to go along with the pattern for Link. I must admit that for a long time, I thought that the character you play in the game was called Zelda. I was not until I beat Ocarina of Time that I discovered that Zelda was the princess that Link was saving in the story. Use F crochet hook unless otherwise stated. Worsted weight yarn: Buff, white, shocking pink, gold, golden yellow, red, and blue. BEGINS TUFFING ARMS FIRMLY. CONTINUE STUFFING ARMS FIRMLY AS YOU GO ALONG. Rds 5-6: sc in each sc around. (6) Change to buff after Rd 6. Finish off in first LEG. Do not finish off in second LEG. Stuff LEGS firmly. Rds 7-10: Ch 1, turn; sc in each sc around, slip st in first sc. (26) Change to shocking pink after Rd 10. Finish off. Weave in ends. Fold Rds 3-12 down. Rd 18: Ch 1, turn; sc in next 2 sc, holding next sc on BODY and first sc on ARM together and working through both thicknesses, sc in next 3 sc, sc in next 12 sc, holding next sc on BODY and first sc on ARM together and working through both thicknesses, sc in next 3 sc, sc in next 2 sc on BODY, slip st in first sc. BEGINS TUFFING BODY FIRMLY. CONTINUE STUFFING BODY FIRMLY AS YOU GO ALONG. INSERT SAFETY EYES BETWEEN RDS 29 AND 30 WITH 5 SC BETWEEN EACH EYE. Finish off leaving a long tail. Weave tail through sc of Rd 37, pull tightly and secure. Weave in ends. Embroider EYEBROWS and MOUTH on LINK. Using picture as reference, fringe on piece of golden yellow to HAIR BASE. Use picture as reference to style HAIR. Rw 2: Ch 1, turn; slip st in next 4 sc, sc in next sc, 2 hdc in next sc, sc in next sc, slip st in next sc, sc in next sc, (hdc, dc, hdc) in next sc, sc in next sc, slip st in next sc, sc in next sc, hdc in next sc, (dc, tr) in next sc, (tr, dc) in next sc, hdc in next sc, sc in next sc, slip st in next sc, sc in next sc, (hdc, dc, hdc) in next sc, sc in next sc, slip st in next sc, sc in next sc, 2 hdc in next sc, sc in next sc, slip st in next 4 sc. Finish off leaving a long tail. Sew CROWN JEWEL to CROWN. 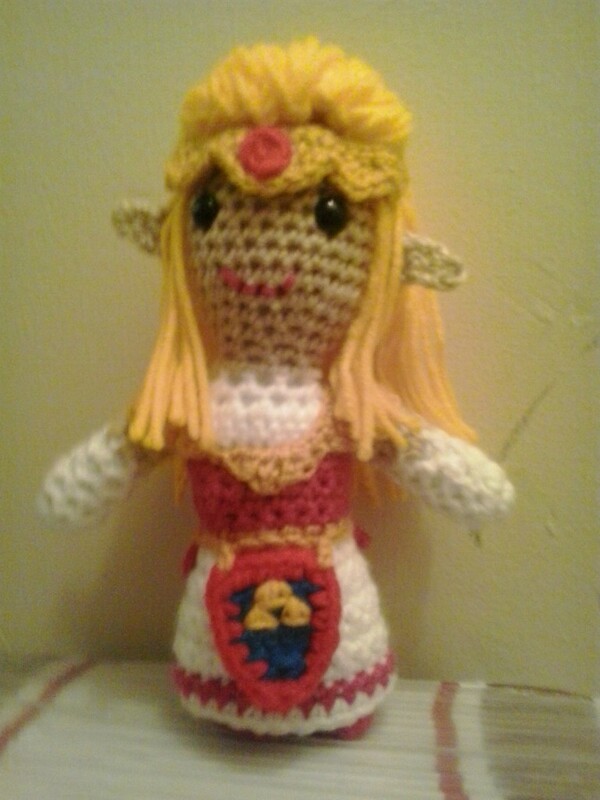 Sew CROWN to head of ZELDA. Finish off leaving a long tail. Wrap BELT around waist of ZELDA and sew together. Rw 6: Ch 22, sc in second ch from hook, hdc in next ch, (dc, ch 1, dc) in next ch, hdc in next ch, sc in next 11 ch. Finish off leaving a long tail. Wrap around shoulders and sew together and tack stitch down. Rd 1: Attach red and using B hook in first ch of foundation ch of BANNER, ch 1, 2 sc in same ch as attachment, sc in next 3 ch, 3 sc in next ch, sc in next 4 Rws, 3 sc in next sc, sc in next 4 Rws, sc in same ch as attachment, slip st in first sc. Finish off. Weave in ends. Attach gold to each top corner, ch 2, slip st into BELT. Weave in ends. Link and Zelda are copyright Nintendo and their respective creators.